Windhover Regency, JMF Cruise Control's sire, is the Morgan Breed's #1 Sire of Black Foals. 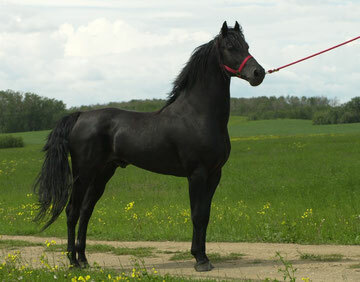 He did not produce chestnut, 60% of his get are black and all foals out of black mares are black. With over 265 foals he consistently rated among the top ten most popular Morgan Breeding Stallions in the World. Regency's sire is the incomparable Beamington, Five Times Rated the "Sire Of The Year", a standard that still stands and for over a decade the only World Champion to beget World Champion offspring. Windhover Regency's dam, The Black Rose, is by the immortal Flyhawk, a great sire who became a Legend in his own time as the most influential working / breeding / show stallion of the breed. Whispering High Beam, sire of JMF Cruise Control's dam, JMF Beam's Misbehaven, is also a Beamington son (see above description) whose dam, Highover Desiree, is a granddaughter of both Waseeka's Nocturne and Upwey Ben Don, the only two stallions whose influence on the Morgan breed rivals that of Flyhawk and Beamington. Misbehaven's dam, JMF Ideal Mischief, is by Cedar Creek Hallmark a son of I Will Command, a prolific stallion whose get have made an indelible mark in the show ring. JMF Cruise Control is a proud, smart, versatile individual who possesses the athleticism, versatility and dynamic motion of the Flyhawk horses. Like his sire's, his offspring will be capable of competing and winning in almost every discipline and be trained and used at home as family horses, trail riding, driving, hunting, packing, breeding, etc.